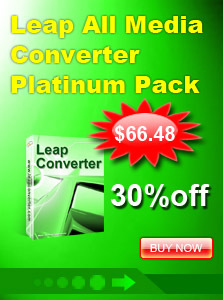 Leap All to MP3 AMR AAC OGG WAV Converter is a super powerful video to audio, and audio to audio conversion tool that it support so many formats. It supports converting AVI, WMV, MPEG, MP4, ASF, VOB, 3GP, iPhone, MOV, FLV video and MP3, AAC, AC3, AMR, M4A, OGG, WAV audio to MP3, AAC, AC3, AMR, M4A, OGG, WAV format files. It can convert between these audio formats. Free download and have try now! 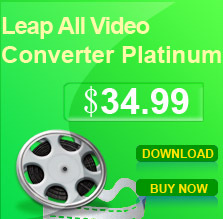 Input formats: AVI, WMV, MPEG, MP4, ASF, VOB, 3GP, iPhone, MOV, FLV video and MP3, AAC, AC3, AMR, M4A, OGG, WAV audio. Output formats: MP3, AAC, AC3, AMR, M4A, OGG, and WAV audio.